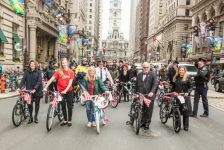 This guide is based on a video that the Bicycle Coalition of Greater Philadelphia created in partnership with The Baby Center. View the video here. A good space to teach your child how to ride A grassy area with a slight downward slope would be perfect, but an open concrete space will work too! Take time to label the pedals L and R so it will be easy for you to put them back on the bike later. Remove the pedals from the bike with the 15mm wrench. Lower the seat so that your child can have both feet planted on the ground. Make sure that the space / slope is safe to coast down. Check for debris, potholes, large bumps, etc. Have your child push off the ground, alternating left and right feet as if running. When your child is ready, they can push off the ground so that momentarily they are balancing and gliding with both feet off of the ground in between pushes. Encourage your child to use less pushes as time progresses. The longer the gliding period, the better! Now it’s time to get comfortable with steering! Have your child move the handlebars right and left while balancing and gliding. This will help your child learn how to adjust the center of balance when the bike turns. While gliding and balancing, your child will probably stop by placing his or her feet on the ground. That is okay in the beginning, but it is essential to teach braking before putting the pedals back on the bike! If the bike has hand brakes, even pressure should be applied on each brake. If the bike only has pedal brakes, then skip the braking step for now. Once your child can ride straight and use the brakes, they are ready for pedals! Re-attach the pedals to the bicycle. Remember, the right and left pedals will only fit on the correct side of the bike. Place one of the pedals in the 2 o’clock position (also called power pedal position) and have your child push down on the pedal with their foot, propelling the bike forward. 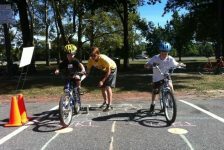 When the pedal reaches the bottom of the circle, have your child remove their feet from the pedal and begin to coast. Repeat with the opposite pedal until they are comfortable on both sides. Next your child can try slow, continuous pedaling. (You may need to provide a little bit of balance from behind in the beginning). Step 7: Put it all together. Have your child pedal down around without stopping for increasing periods of time or distance, coming to complete stops after each interval. You can start with 10 seconds or 1 minute depending on your child’s comfort level. As your child’s confidence increases, their speed will increase as well. Have your child practice common skills listed below or participate in an organized Bicycle Rodeo (see Safe Routes Philly’s Bike Rodeo Guide).